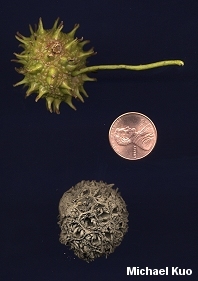 Distinctive leaves are star-shaped, 5-pointed, finely toothed; fruit a distinctive spiny ball; ranging from eastern Texas to Pennsylvania. Habitat: Often on moist soil in bottomlands; occurring in a wide variety of forest types; ranging from eastern Texas to Pennsylvania. 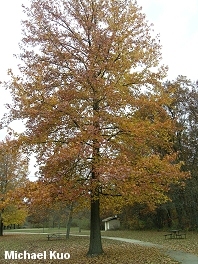 Stature: 80-120 feet high; to 4 feet in diameter; with a fairly narrow crown and an elegant main trunk. 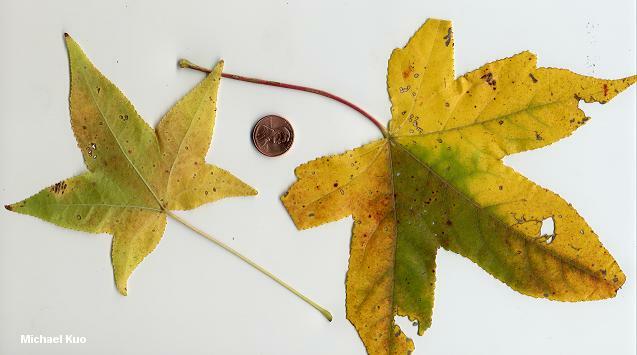 Leaves: 4-7 inches long; star-shaped, with 5-7 pointed lobes; shiny and pale green above; paler below. Bark: Thick; grayish brown; furrowed or scaly in age. Fruit: A distinctive ball; to 1 1/2 inches long; round; spiny.